For someone who grew up watching their dad eating tomato sandwiches, many would think it’s odd that I don’t like tomatoes. It’s not that I don’t like tomatoes at ALL. I LOVE ketchup, spaghetti sauce, and many salsas (the sauce of the salsa, not the actual tomato chunks.) With that being said, during this weekend’s pasta party, I recruited nine fellow eaters to help me taste test Dei Fratelli Sauces & Salsas. Dating back to 1923, when Carl R. Hirzel began growing and canning vegetables, the Hirzel/Dei Fratelli families now produce a wide range of tomato-based products (and interestingly – sauerkraut.) In addition, all tomato products are guaranteed GMO-free and most of their products are Certified Kosher as well. Our testing group tried Fire Roasted Vegetable, Tomato & Basil, and Traditional Pasta Sauces. Dei Fratelli Traditional Pasta Sauce – This one was my favorite and many of the testers agreed with me. The sauce had a bold, authentic Italian flavor that was savory with a hint of sweetness. I thought that maybe they’d mixed in some sort of meat sauce to get the savory flavor, but when I checked the ingredients, I saw nary a meat. I think that the Romano Cheese that is in it must be providing the extra something to the flavor. Dei Fratelli Tomato & Basil Pasta Sauce – The rest of the testers thought that the Tomato & Basil was their favorite. It has larger pieces of diced tomatoes mixed into the sauce which one tester loved. It has a great balance of flavor, while still allowing the tomato and basil flavors to showcase themselves. 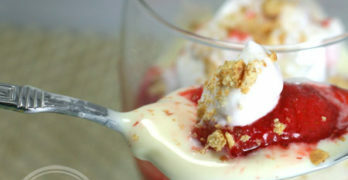 It was a good mix of sweetness with an extra kick of flavor. Dei Fratelli Fire Roasted Vegetables Pasta Sauce – Complete with crushed and diced tomatoes, zucchini, onions, carrots, and two types of peppers, the Fire Roasted Vegetable is perfect for veggie lovers out there. It has a milder flavor that is sweet and the texture is somewhat reminiscent of salsa. Up for testing (with the help of 3 bags of tortilla chips) were Black Bean n’ Corn, Casera – Medium Hot, and Original – Medium Salsas. Dei Fratelli Black Bean n’ Corn Salsa – Medium – This salsa has an amazing chili flavor to it. It has a kick of spiciness mixed with a great sweetness that comes from the corn. It has a distinctive flavor that isn’t overpowering. I’m not sure if you can tell from the picture, but the salsa jar is about 2/3 empty since it was the favorite of the majority of the testers. Dei Fratelli Original Salsa – Medium – This is a great classic salsa. It wasn’t too spicy and had a nice tomato flavor to it. One of the testers, a self-proclaimed salsa connoisseur, had taken her favorite Pace salsa out of the fridge to eat with the tortilla chips. After tasting the Dei Fratelli Original salsa, the Pace salsa went back into the fridge and the Dei Fratelli was declared her new favorite salsa. 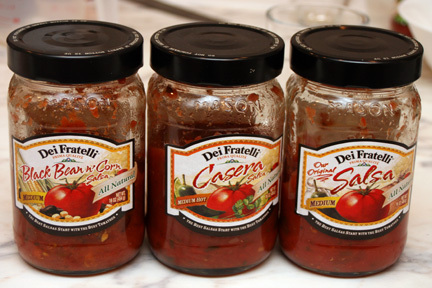 Dei Fratelli Casera Salsa – Medium Hot – If you like spicy, this is your salsa. The Casera salsa deftly adds the heat so that you still get a strong kick without being overpowering. As you can tell from the salsa pictures above, and as I know from the empty (as in scraping the inside of the jar with a spoon) pasta sauces, Dei Fratelli was a big hit at our pasta party. 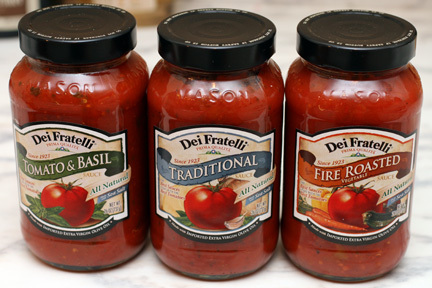 All of the Dei Fratelli Pasta Sauces and Salsa quality products that we tested had great flavor and tasted fresh. If you have a chance to try Dei Fratelli, I hope your experience was as delicious as ours. Dei Fratelli are available in stores nation-wide or online. Disclaimer: No compensation was given for this review. I did receive samples of Dei Fratelli Pasta Sauces and Salsas for the purpose of writing this review. This did not influence my opinions.